Pantone, the self-declared official body in control of the entire visible spectrum, has announced the color of the year for 2014. You're looking at it. Dubbed Radiant Orchid—you can use its technical name PANTONE 18-3224—it's actually... kind of just... pinky purple? Still, a very nice shade of pinky purple. 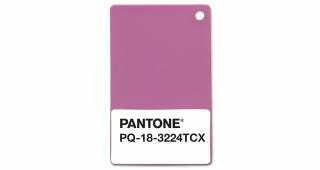 And, boy, you better get used to to seeing it around: when Pantone chooses a color of the year, you can be certain you'll see it in clothes and drapes and mugs and phone cases and who knows what else.